This is a showy and refined Orchid hybrid. I always enjoy seeing Pansy Orchids and find their large and boldly colored flowers to be intriguing. ‘Isler’s Red’ is no exception and stays true to all of the endearing qualities of the genus. While certainly a challenge to grow at home this native of Central and South America can be rewarding to cultivate. They often come out with good spikes of long lasting flowers. Since my week was broken up by the earlier windy and rainy conditions I keep thinking today is Friday. Oh well one more day until the weekend and it is time to start hunting around for some seasonal photographs. We haven’t had a frost but the mornings seem quite cool but that has been giving way to some beautiful days. Love Pansies as we can plant them in the fall here in North Florida. My aunt loves orchids and the color pink, so I’m pretty sure that she’ll love these pansy orchids! 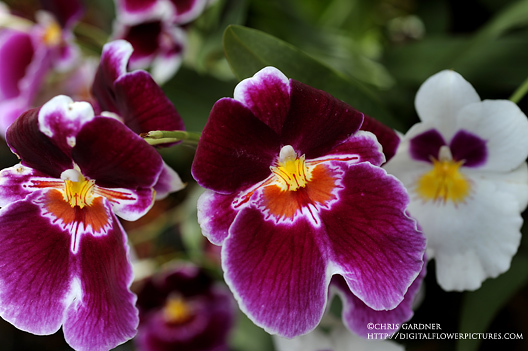 I will print this nice photo of your Isler’s Red pansy orchids and give it to her. Thanks for sharing!